Silverstack offers you a very flexible folder renaming feature, which allows you to create a custom folder structure on your offload and backup destinations. For every copy destination you can define individual folder structure options. If you start a copy process to different destinations, you can have different folder structures on every destination. Or you just can create a clone of your source material. There are a variety of software tools in the postproduction process which require a specific folder structure. 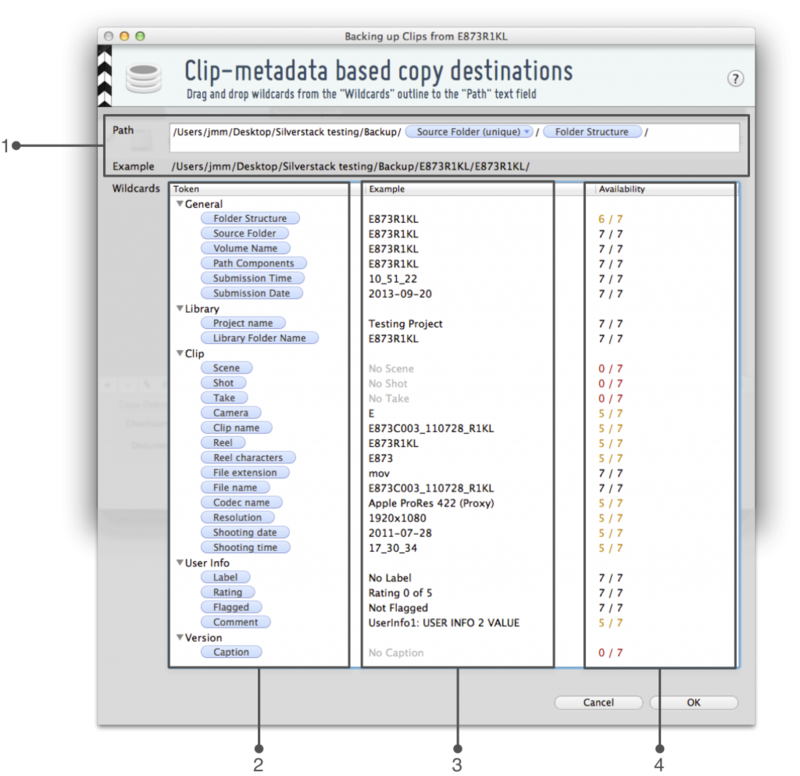 To simplify the organization of the clips related to the different folder structure requirements, Silverstack offers this useful feature that automatically helps you to structure the files. To determine the names of folders you can add a various set of metadata placeholders – called wildcards – that will be replaced by the actual values of each clip during copy. This means that Silverstack is able to automatically save your clips in a specific, individually determined folder structure. So for example your files can be stored in folders according to their submission date and carry the project name and submission time in their file names. Wildcards can be added in the destination selection step (figure 1) of the “Offload” and “Backup” wizard. Therefore you first need to choose a drive and a folder (figure 1 #1). figure 1: the Backup wizard. Choosing the destination path. It is important to have in mind that when selecting the “Always preserve folder structure” option, all files not considered as clips by Silverstack (such as: non fully supported camera formats, image file sequences, sidecar documents, PDFs…) will be copied in the same path of the clips. All documents will preserve the same folder structure of the original medium – that means all clips are in the folders you have created. 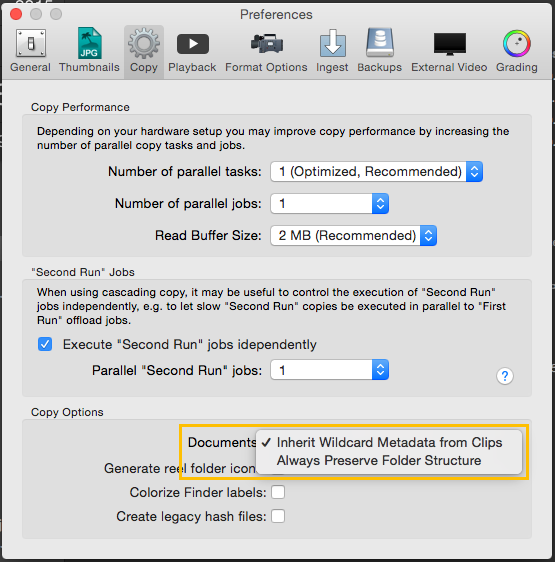 Make sure that the path you have determined by choosing a drive and folder (figure 1 #1-3) is not changed or deleted unintentionally in the editable path field of the wildcard wizard (figure 2 #1). Just add wildcards to the already existing path components. In the path field you have to separate the single wildcard tokens by a slash (“/”) if they are supposed to mark a folder structure. Separate them with a dash (“-”) to combine different wildcards for one folder level. Filenames should contain some wildcards in order to make them unique. Silverstack checks the uniqueness of all created file paths and warns you if necessary. The wildcard wizard (figure 2) at the top shows the full destination path (figure 2 #1) which is editable. You can either type path components in the text field directly or drag and drop wildcards there from the list below. Beneath the text field you can see an example of the pathname including wildcards using one of the clips you are going to copy. All available metadata fields are shown in the wildcard list. So you can name your files and folders according to information as submission date and time, project name, various clip information and others. The tokens (figure 2 #2) can be drag&dropped into the path field (figure 2 #1). The next column (figure 2 #3) contains an example of every token as it will be seen in the final path- or filename. The third column (figure 2 #4) tells you how many of the previously selected files contain this metadata information. Some wildcards like the submission time (figure 3) offer several options. You can choose between those by clicking on the small triangle. For the path components wildcard you can choose the amount of path components of the source folder structure of the clip – this information will be include in the path of the newly generated folder structure. So if you choose “3”, the last three levels of the folder structure of the original clip are included in the new clip’s path. For reel characters it is possible to choose parts of the reel name as wildcards. You either can select the first or if applicable the last characters of the reel name.